Obituary for Bernard I. Schmitt | Pearce Funeral Home, Inc.
Hubbell: Bernard I. Schmitt, Sr., 94, of Hubbell, passed away at The Lighthouse at Hubbell, after a long illness, on May 25, 2018. He was born on July 16, 1923 in Warren, Michigan, a son of John and Jeanette (Jacobson) Schmitt. He attended Sacred Heart School in Laurium before he went to work at “Camp Four Eye,” a CC Camp in Mass City. He was in the Army-Air Force during World War II, serving for 3 years in New Guinea, The Philippines, and The Pacific Theater. He worked for Cadillac Motors in Detroit, C&H Mining and White Pine Mining, and Horner Flooring. He owned BG’s Bar in Tamarack with his wife. He worked as a custodian for Gloria Dei Lutheran Church in Hancock and at the Calumet Methodist Church. Bernard was married to Gloria M. Thornton in Detroit on December 24, 1942. She passed away on December 19, 2003. He was a lifetime member of VFW Post 4624 in Hubbell and a lifetime member of Post 90 American Legion of lake Linden. He cooked for many fundraiser dinners for both organizations, and he was known for his work on the “corned beef and cabbage dinner” for 48 years. 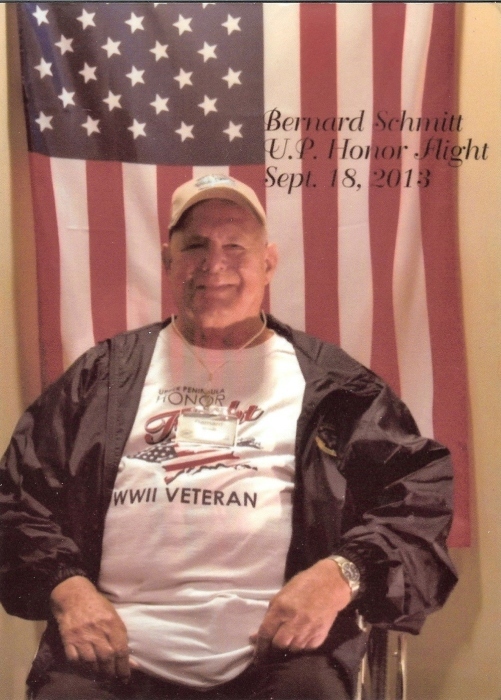 In 2013, he was able to go with Honor Flight 5 to Washington D.C. He served with the D.A.V. and was a former member of the #17 North Star Foresters of Calumet, MI. He was preceded in death by: his parents; 2 sons-Bernard, Jr. and Mark; a daughter-Christine; a grandson-Kevin; 3 brothers-John, Jr. (Edith), Joseph (Mary), and Melvin; 5 sisters-Jeanette (Ed) Wetelainen, Bernice (Al) Kotojarvi, Merle (Russell) Provost, Audrey (Martin) Quello, and Joyce (Bob) Kisul. He is survived by: 2 daughters-Gloria (Charles) Pihlaja and Sharon (Ron) Aittama; a son-Ronald (Mary) Schmitt; daughter-in-law-Alice Schmitt; 11 grandchildren-Dale Kus, Craig (Tammy) Kus, Marc Kus, Jackelyn (Dave) Dokman, Corey (Tracey) Aittama, Carrie (Dan) Bartell, Sarah (Tom) Derry, Brian Schmitt, Alan (Jen) Schmitt, Chad Schmitt, Christi Schmitt; 19 greatgrandchildren; 4 great-greatgrandchildren; sister-in-law-Ann Schmitt; a special friend-Sarge; a special nephew-Bill; and numerous nieces, nephews and cousins. Bernard’s family wishes to thank Dr. McConnon and Melissa Salani and the staff at The Lighthouse at Hubbell for the care that he received. The Mass of Christian Burial will be celebrated at 11:00 A.M. on Thursday, May 31, at St. Joseph Catholic Church in Lake Linden with Fr. Joseph Boakye Yiadom to officiate. Visitation will be from 5:00 until 8:00 P.M. on Wednesday, May 30, at the Pearce Funeral Home in Lake Linden with a Veteran’s Service at 7:00 and Rev. Robert White to conduct a prayer service. Burial will be at the Mount Calvary Cemetery in Lake Linden with Military Rites. In lieu of flowers, donations may be made to the Hubbell VFW Post 4624 or to Post 90 American Legion of Lake Linden.